Can any bike be all things to all riders? Probably not, but the Honda CB500F gives it a damn good go. 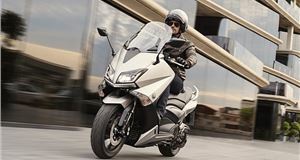 Whether you’re looking for a first big bike after gaining an A2 licence, something to commute on or a motorcycle with good handling, performance or affordable costs, the CB has plenty to commend it. 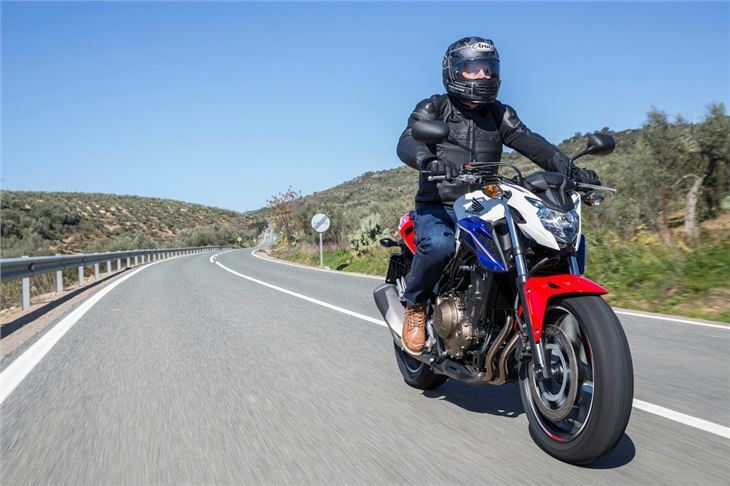 It helps that Honda has wrought more than 200 changes to the current bike over its predecessor, which was far from disappointing in the first place. 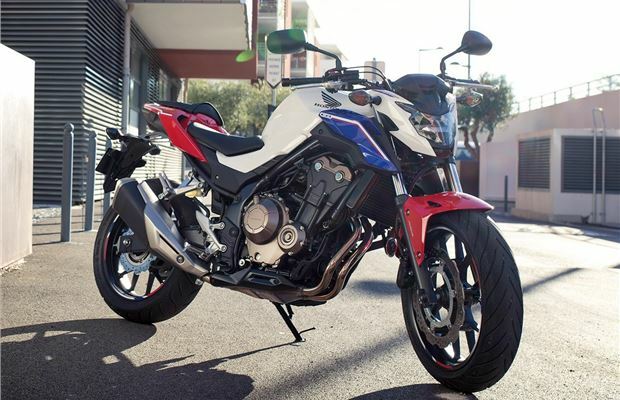 Prime among those updates are the thoroughly modern styling of this latest CB500F. Available in a choice of four colours, the small front fairing and minimal side panels give it a bit more bulk than some others in this class, yet at 790mm wide you can easily take gaps in city traffic. Other changes to this machine are a new exhaust and air intake so the 471cc parallel twin-cylinder engine can rev a little more liberally. These may be detail engineering updates, but the effect was noticeable the instant we swung a leg over the new CB compared to the older one. 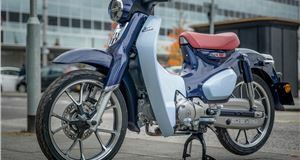 The motor starts with typical Honda ease at the first touch of the button and settles to a characteristic two cylinder whirr. 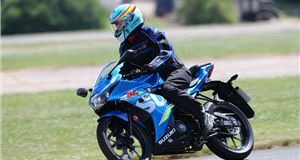 A six-speed gearbox is standard and snicks through each cog with more ease than many Hondas of old, adding further to that immediately familiar, easy going appeal. On the move, the engine can become a little vibey above 6500rpm, but it’s delivered its best work by then, so much better to change up a gear and use the surprising generous torque to waft along. That comes to a peak at 7000rpm and maximum power is delivered at 8500rpm, so you do have to work the 500’s motor if you want to treat it like a sports bike. However, during our time on the CB, it always performed as conditions allowed or dictated with enough in reserve for overtaking. If you do choose to rev the engine in its higher range, those vibrations can instil some numbness in your posterior and fingers, so another reason to ease off slightly and bask in the Honda’s other charms. One of those key charms is its superb handling. Okay, it’s not going to give a Fireblade a hard time, but you’ll be more than pleasantly surprised at how well the CB can hustle down a back lane. The wide bars give you loads of control and confidence, and there’s lots of feedback too through the forks so you can make the most of the available grip on any road. Even in streaming wet weather, the Honda keeps you fed with information. That has the added benefit of letting you meter out braking effort from the single 320mm front disc with twin piston caliper. 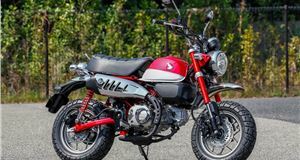 It’s fine for everyday riding and won’t catch out newer riders coming to a big bike for the first time as initial bite is very progressive. 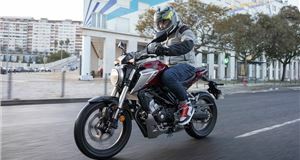 Some longer serving riders might find that means the stoppers are not quite as quick to react as they’d like, but there’s no doubting the CB500F’s ability to come to a halt in a swift, controlled manner. There’s also ABS as standard should you encounter a patch of spilt diesel or sudden change in road surface. In town, the CB500F remains a brilliant commuter machine and you can see why courier riders still choose this bike. There’s generous steering lock and a small turning circle, while the riding position places you upright for excellent vision. Comfort is another big plus for the CB, with the caveat about a numb backside if you rev the engine too high for too long. On longer rides on A-roads and motorways, the Honda is as good as any unfaired machine at keeping wind blast at bay. Lean forward a little over the tank and you can easily cover 100 miles between stops without feeling battered. 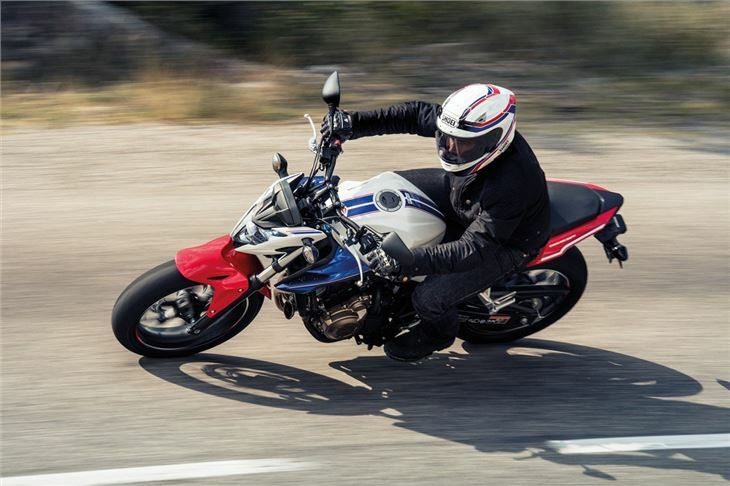 You could choose the CB500X adventure-style machine if you wanted more protection from the elements, while the CB500R is a racier looking prospect, but neither is as good as the standard F model. Honda also offers the custom cruiser Rebel that shares its frame and engine with the CB, but again the base machine wins out for us. Wherever you ride, the CB’s mirrors give a clear view of what’s behind. It’s a shame the digital dash is not always as easy to read at a glance as it can occasionally be overcome in bright sunshine. Also, the left-hand switchgear takes a little getting used to as the horn button is placed above the indicator control, so we ended up pressing the horn when meaning to indicate left or right. Apologies to anyone we tooted when trying to make a turn signal. 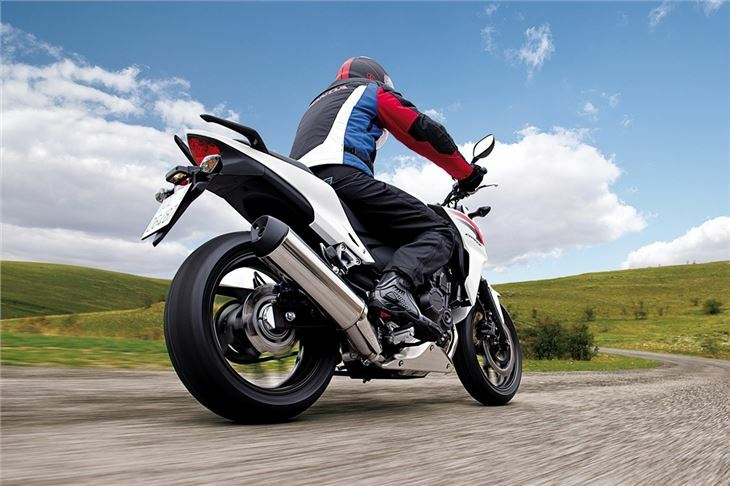 That aside, the CB500F is a bike you quickly come to appreciate and relish riding. Rather than being a machine that tries to please everyone and satisfies nobody, it comes close to being all the bike you’ll ever need. The way it mixes new rider friendliness with enough depth of ability to keep longer serving practitioners happy is a balancing act few others pull off. It’s also why, even when it’s not the cheapest option in this sector, the Honda remains the class of the field. Performance: Top speed 112mph. Fuel consumption 83.0mpg. VED £64.